Jan Webb in LateNightStampers showed a card sample of something called a TRI Shutter Card. It looks more like a Quad Fold Card; but that’s just me. Just by a few folds and cuts it makes this great fold. I found some written instructions but to make it really easy to understand I took some photos. Wait till you see how easy this really is and the wonderful results. 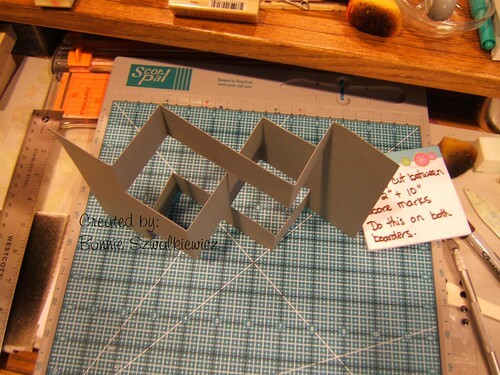 Start with a 12″ long piece of card stock that is 5 1/2″ tall. This size will fit into a standard invitation size envelope when all folded. 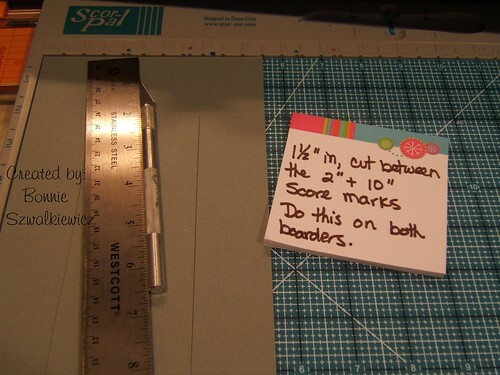 Turn the card stock and now measure 1 1/2″ in from the long side. 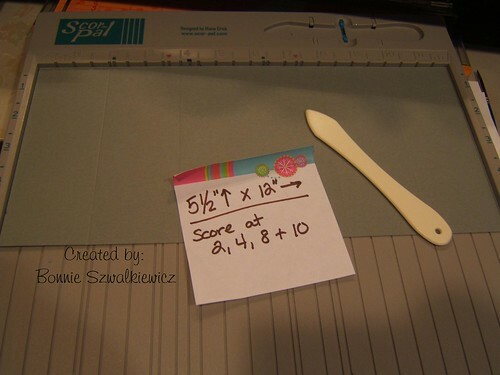 Use your craft knife and make a slit starting at the 2″ score and bring it down to the 10″ score mark. Make sure to do this on BOTH long sides. This picture shows the mountain & valley folds much easier than can be written out. Just take a look and make your folds as pictured. 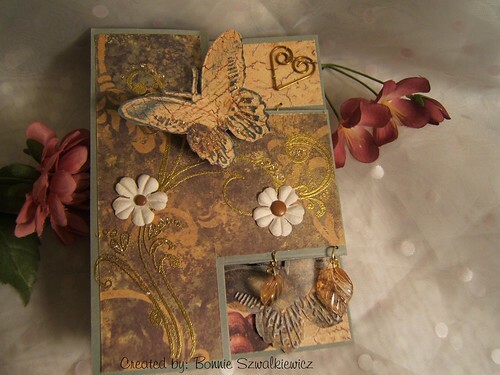 Now I’ve added decorative scrapbook papers (DSP) to each of the surfaces of the card. I made sure to leave a little boarder around each piece of the DSP; 1 for looks and 2 so that when the card is folded the DSP won’t buckle. Stamped and embellished. This view shows me looking down on the card so you can see all of the 3-d folds. I’ve laid the card flat for photographing so you can see all the decorations. I’ve got the card tipped a little bit for photographing, but this is the open view while standing. Here’s how the card looks all folded up and ready to be inserted into an envelope. “Just a little note…” by D.O.T.S. n/k/a Close to my Heart. N-E-W!! VIDEO TUTORIAL! 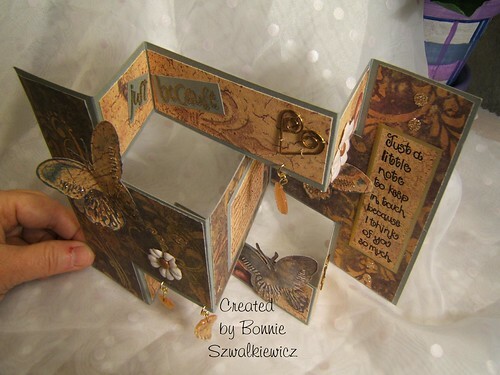 Beate Johns was kind enough to make a complete video tutorial on my TRI Shutter card sample. It is hosted on SplitCoastStampers.com under resources. You’ll need to scroll down the page past the photo tutorial (don’t forget to look at the newest version of TRI Shutter card that I made along with a fan fold flower! ); at the bottom you will see the video. Not only does she make another wonderful sample for you to see, but you get to hear her cute little accent! OMG!!!!! That is gorgeous. How about you demoing for me next time we get together? Of course, we have lots of other stuff to share as well!!!! This is awesome. Looks like a lot of work. 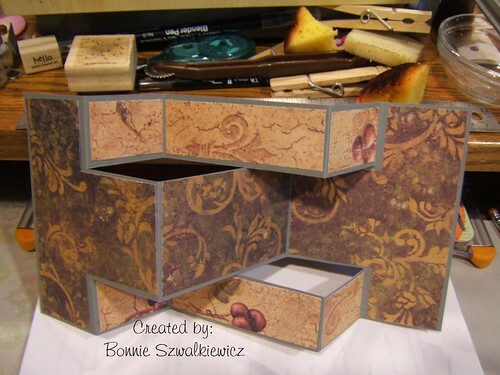 Really cool card Bonnie…..thanks for posting all the instructions with pictures!! I need to try this. I am such a “show me” learner and you did such a great job with the photos. I appreciate the time you took to create the tutorial – I can’t wait to try it out. Your example is gorgeous!!! You’re the folding GODDESS!!! I’ve been seeing this on splitcoast and on blogs, and printed the pictures to try it this weekend. OMGosh, you’ve made my week. I love your dangling charm on the inside edge there. Woweeeeeee! I may just have to try this…..I bet my friend’s and family will think I’m a genius!!!! LOL Thanks for sharing. Bonnie~This is such a wonderful tutorial. And the card??? Just spectacular. I love the whole thing!! I’ve seen this design on many sites lately, but none as beautiful as what you’ve created here. Thank you for sharing all of this. I LOVE YOUR WORK!! Oh my goodness… I have to look at my list of upcoming occasions to make this for a special someone indeed! Wow. Simply gorgeous and when I get back home I will for sure give it a try. thank you so much for creating this card to fit in an A2 envie…. Oh, WOW! This is amazing! I can’t wait to make this! Your instructions are fantastic and your card is absolutely gorgeous! I am also glad you showed what happened when you had an element larger than the section it was on (lower butterfly) – nothing bad happened – it just overlapped! I love that look! I would like to make one of these, show it on my blog and send others here to see instructions and your card. Would that be ok? I hope so! Joy, Thank you so much for your kind comments! Yes, please do a link to my blog for the instructions, that way I will be able to check back and see other ideas. 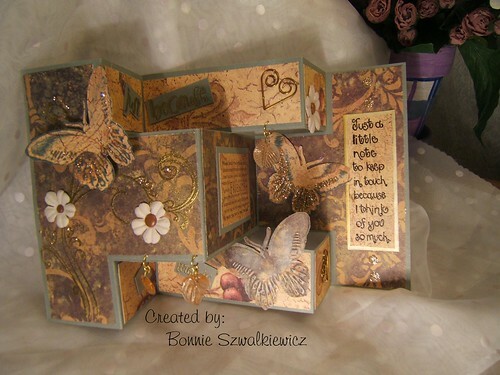 This card is absolutely awesome…thank you SO much for the tutorial…this will be my first weekend project! This is breath-taking! !1 I love it. Thanks for the directions. I want to make one for my desk at work. It is a piece of freestanding artwork. You made my day. Thank You! HOLY Quad Fold This is BEAUTIFUL!! AMAZING!! WOW!! I hope I can do it. WOW WOW WOW!!! OOO OOOO OOOO I made One I made one..IT is not as pretty as yours BUT I IS VERY HAPPY!! I made it for my sister’s birthday. I will try to post it on my blog tonight.. With a link back to U!! Thanks for sharing this beautiful card an the tutorial. I will try to make it today. Hope it will out as ubelievable beautiful as yours. I have tried to make this one, no luck, is there a video from this card on Youtube? I just tried make this card and can’t believe how easy it is to make. Great instruction. And your card is fabulous. It really inspired me to try it. Thanks for sharing. OMG this is beautiful. 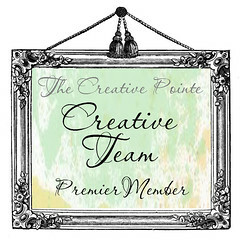 I was just on a friends blog who has just made a card like this and put a link on her blog to here. She did say it was easy to make but I thought no way will I be able to make that!! But your directions especially the pictures make it real easy to understand. I will defo try this now. Simply gorgeous. Thank you so much for the tutorial. Your card is wonderful! I did get one made but no where near as fancy. I keep looking at it over and over again. Can’t wait till I have the time to try one. Just wanted to say thanks for the lovely tutorial. A friend of mine made one of these cards and I fell in love with it. She pointed me to your blog so I could make one too. I hope it’s ok if I posted a link to your blog on one of the message boards that I post my work on. They wanted to know how I made the card so I pointed them to your blog for the tutorial. My card is posted on Fiskateers.com. Thanks again for the wonderful and easy to follow tutorial. Stunning card..I have to give it a try ..Thanks for Sharing!! This is beautiful!!! I had never seen anything like it before. Got the directions and gonna give it a try. Thanks so much for making it so clear! Thank you so much for the tutorial on this awesome card! It is just magnificent! Thank you for sharing! Wow! Thanks so much for sharing. I hope mine turns out half as good as yours. Wow, spectacular card! Thanks for the tutorial! One of the most gorgeous cards I’ve ever seen. BRAVO!!!!! This is just beautiful. Thanks for the easy to follow tutorial. OMG! I just saw this on the SCS challenge for today and am seriously considering going home “sick” from work so I can make one! This is absolutely stunning. Thank you so much for the wonderful tutorial! Thanks so much for sharing this beautiful tutorial! Awesome…thanks for the easy to follow tutorial and for sharing this with us. Absolutely love it!!! I cannot complement you enough…. you are so clear on your tut….. I will be carding all night with this pattern, you make it soooooooooooooooooo easy. I am speechless! Each section is a work of art in itself. Thank you soooo much for sharing. WOW!!! Amazing card and wonderful tutorial. Thank you for the awsome tutorial…. I love making this style of card. Will definetly make this again. Absolutely gorgeous. Thanks for sharing the card and the instructions. The TLC 221 in your “search” comes up with “no matches found”. Any other ideas of where more samples of this amazing card would be? Wow! Wow! Wow! I HAVE to try this. Thanks for sharing! This is utterly fabulous! I’m so glad Lynn featured it on SCS or I would never have seen it! Thanks for sharing!!! Wow. I’ve seen this before, but your instructions just make it completely do-able!!!! thanks! Wow! That is absolutely incredible and amazing! Thank you very much for sharing tutorial! I loved your tutorial, and am going to have to give it a try. Thank you so much for an excellent tutorial, this is my first successful folding card! I just stop by your great blog, an d saw this tutorial. OMG!! This is beautiful!!! I love how you added the charms – PERFECT!! Thank you so much for the tutorial. Will be perfect for Mom’s Birthday in August!! Funny how I have the same stamps, but never made a card with them that looked this good! Thanks for the instructions and the inspiration. I plan to CASE it soon! Thank you for an awesome tutorial! Your design is gorgeous. I cannot wait to make my own! ABSOLUTELY GORGEOUS!!! YOUR WORK IS AMAZING…! Oh Wow…this card is stunning. Thanks for the tut, I will definetly have to try this out. Wow your card is awesome and your tut is so clear, thank you so much for sharing. WOW this is awesome! Thanks for such a great pic tutorial! OMG!! Beautiful! Probably the best folding I’ve ever seen! Thank you soooo much for inspiring me. What a fantastic card, I’ve just printed off the instructions and can’t wait to start. I will share it with my card making friends tomorrow evening. That is a really beautiful card!! I HAVE to use this technique now! This is absolutely beautiful. Never saw this cut on a card, but most fanscinating is the way you decorated the card. I love every touch you added. Thanks for sharing. Glad I came along your site! Have a great day! Exquisite card! Great directions too. It is a work of art, I love it. Can’t wait to try one. Wonderful as always. Here is my using mostly Stampin’ Up! This is a wonderful tutorial, thank you! I love picture rich tutorials, much easier for me to get the idea 🙂 This went to my bookmarks immediately! Thanks so much for this toturial can’t wait to try this out. Your card is just beautiful! I LOVE this card! I have been stamping for 20+ years and have never seen a card like this. What a wonderful cut and fold! What size envelope does this card fit? Thanks for much for your explanation and pics. Will definately give this a try. LOVE this card! I made it for my MIL’s b-day this month. She thought it was SUPER cool. Here’s my link…. Hope to see more of these as they are great and so easy to make! 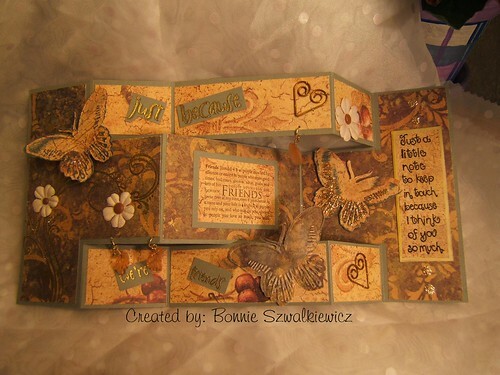 Awesome card & great tutorial … thanks so much for sharing! I am so excited!!!!! I LOVE to stamp and create cards for any/all occasions and I just know this technique is going to lend itself to all kinds of new ideas…..Thanks soooooo much! This card is really beautiful! Thank you for sharing the directions. This is the most drop dead darling idea I have EVER seen. Am outta here to make one right this minute. Thank you thank you thank you for this amazingly clear tutorial. Amazing card! Thank you so much for the tutorial! TOTALLY Gorgeous!! Everything inch of it is awesome, Bonnie! thank you for sharing this, it’s a great tutorial. Lovely card. I’d love to put a link on my blog to yours if that’s okay. This is wonderful, I just made a scenic one and I love it. Thanks so much for the tutorial. Great card. I just love to make cards that do something besides just open with a message. i just learned the joy fold card and love it. Thanks for great instructions. This is great. My friend just e-mail me your page. She made it also. It was so easy. Thanks for such great instructions!! WOW! this is a stunning card! thanks for the great instructions and pics! Wonderful directions!! I love this card…TFS!! this is a truely beautiful card, thanks for sharing this. WOW!!!!! I LOVE… LOVE… LOVE this! I can’t wait to try it out and show my friends! It’s a perfect card to make for all the weddings we have coming up!! It’s sophisticated yet simple! Thanx for sharing! Thanks for the tutorial, it’s so much easier with the scorpal! Come look what I’ve done since reading your tutorial! Thank you for sharing the instructions on the shutter / panel card! I have been playing with it all weekend, and find that the consept has endless possibilities. Thanks so much! Absolutely stunning – your instructions are very clear. I wish I was at home making one instead of being still at work! This is astonishingly beautiful! Thank you for sharing the tutorial. Thanks for the instruction. It was a realy lovely card. I linked your blog on mine, showing a card I made using your template design. What an amazing crafter you are! Thanks. Thanks for sharing this. I have done it and its turned out fantastic. I cant thankyou enough for this its so versatile and very different which is what I look for. AWESOME thanks bunches for having this posted!! Beautiful card, Love all the detail! You are Amazing! Thanks for Sharing!! I will sure be making some of these soon…….lol. I just love your card. Such a wonderful creative idea. Thanks for sharing with all. This is such a wonderful tutorial. Thanks so much for posting it. I made my first tri-fold card and loved doing it!! Hi I would like permission to link to this blog from my webstore. 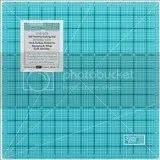 What a great reason for a nonscrapbooker to buy some of the amazing 12 x 12 cardstock sold at papertemptress.com. Thank you for this fabulous tutorial. Thanks so much for this beautiful tutorial and the variations. It was a great success at my hostess club last week and I’ve posted my version on my blog too. I found you through Google search. This is a great tutorial and a beautiful card! Thanks so much for sharing! wow, thank you so much for sharing this! I just discovered your page and just had to try this one though I actually was going to get some sleep! well… this card can’t possibly stay undecorated until tomorrow so I think I have to do this now instead of getting some sleep. 😉 thanks again! take care! Your work is just beautiful, thanks for sharing. I am going to try to make one too. Thank you for sharing this beauiful card. I and a few other women belong to a club “Sizzix Club’ we meet once a month. Our project for December is to make one of these cards to share with the others. I have never made one of these type of cards, but I am going to do my best by following your example. Very nice! Thanks for posting really simple instructions with fantastic photos with every step. Took me literally 5 minutes to cut and fold…now onto decorating!! Hi there, is a pleasure to send you this message because I loved this card. And the wonderful tutorial that you posted, I managed to do it. Gorgeous card, fabulous tutorial! Love the dimension and layers! I am happy this email was sent to me. Now looking at this card has given me ideas for Christmas cards. Really creativity and love it. Je vais mettre votre blog en favoris, mes enfants et moi nous allons v�rifier souvent les mises � jour. This looked like French to me. Using Babble-fish this text translated as: I will put your blog in favourites, my children and me we often go v�rifier the settings � day. TRI-SHUTTER CARD (#3) « Oggi’s Obsession! Wednesday’s Card: Tri-fold Shutter Owl Party! Make a nifty zig-zag card blank!